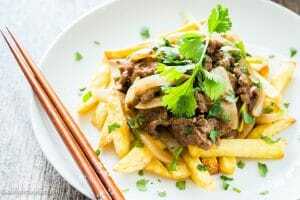 This delicious celery leaves beef stir-fry dish features crispy French fries, and tender and savory beef with the intense aroma from celery leaves. If you try this dish, from now on you will never want to throw celery leaves away. The aroma and flavor from them are incredible. 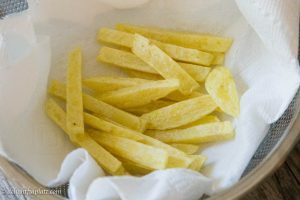 I will also share with you all my tips for making perfect fries. To me, homemade fries are the best. 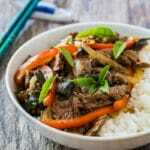 Beef potato stir-fry (Bo xao khoai tay) is a common home-cooked meal in Vietnam. It’s also one of those dishes each family cooks differently. 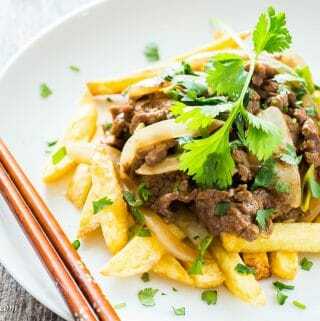 My favorite way to cook it is to make a crispy batch of french fries, stir-fry beef with aromatics such as onion and celery leaves, then top the fries with the beef. My housemates in London asked me to make this every week because it’s super easy yet tasty. The only special skill it requires is patience, and I will explain more in the post. 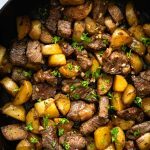 The main ingredients in this recipe are beef, potatoes, celery leaves, leeks, and onion. Let’s start with celery leaves first. I guess many of you may wonder what the heck this is right? It’s just the leafy part on top of celery stalks. In the U.S., celery is often sold in bunch with little green leaf remaining. I always think this is so wasteful because the leaves are so flavorful with an intense aroma. They have the same scent and flavor as celery stalks but stronger. I sometimes see some bunches of celery with a decent amount of leaves at my local grocery store. You can go to Asian/Vietnamese/Chinese grocery stores to get a celery bunch with plenty of leaves. 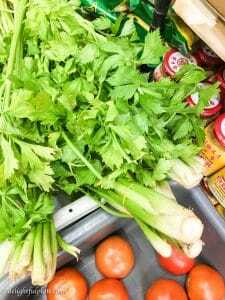 The one at Asian grocery stores has thinner stalks, and the leaves have even stronger celery taste and smell. Below is the photo of celery leaves I took at my Vietnamese grocery store the other day. In Vietnam, we use celery leaves in stir-fry all the time. I seriously think you should give it a try if you haven’t. 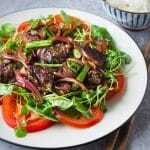 As I already mentioned in my Thai basil beef stir-fry recipe, my favorite cut of beef for stir-fry is flank steak. It’s flavorful and easy to slice. I like using Yukon gold potatoes to make french fries. They are in between waxy and starchy potatoes, resulting in a great texture after I fry them. Please feel free to comment to let me know which type of potatoes you like to use for french fries so I can try them next time. Do you remember at the beginning of this post, I said that the only special skill you need for this dish is patience? Here’s why: you need quite a lot of patience to cut potatoes into thin matchsticks with an even thickness (about 3/8-inch). We want them to cook uniformly. Next, you need to let them soak in water to get rid of excess starch. You will then need to give those cute potato matchsticks enough time to dry before you fry them. Everybody loves crispy fries, and nobody likes soggy fries. Therefore, you will need to use a lot of oil in something like a wok, a wok-shaped pan or a deep heavy-bottomed pot. If not enough oil is used, the fries will absorb more oil and be soggy. Besides, you should fry them in small batch to ensure adequate temperature of oil and evenness of cooking. Yes, that takes time. My final tip for crispy fries is to double fry them. This requires more cooking time, thus more patience. However, it’s totally worth it. 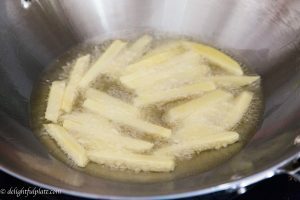 Double frying will result in fries with a thick layer of crispy skin, and they will remain crispy for quite a while. I think we spent about an hour taking photos and the extra fries I made were still crispy when we finished. 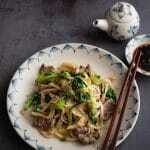 For the beef, you should slice it thinly against the grain in a stir-fry dish. If your pan is small, stir-fry the beef in batch over medium high-high heat. It’s important not to overcrowd the pan. 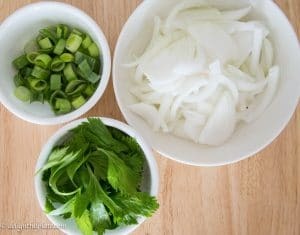 Celery leaves and leeks should be added at the end of the cooking process to retain their flavors as much as possible. Though it can take a considerable amount of time to prepare and cook this dish, I think you won’t regret making it. 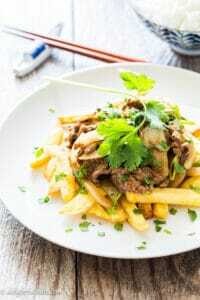 This delicious beef stir-fry dish features crispy fries, tender and savory beef with the intense celery aroma from celery leaves. Prepare a big bowl of cold water. Peel potatoes and place them in the bowl of water. Cut potatoes into matchsticks with 3/8-inch thickness. Also put all matchsticks in the bowl and soak in cold water for about 10 minutes. While potato sticks are in cold water, slice beef thinly against the grain. Put beef slices in a bowl, add chopped garlic, oyster sauce, dark soy sauce, cornstarch, olive oil and black pepper, mix well. Set aside to marinate. After 10 minutes, take potato sticks out of water, spread them on a large baking tray lined with a thick layer of paper towel. Place paper towel on top of potatoes, press to absorb excess water. Change paper towel as needed and let them dry, about 10 minutes. While waiting for potatoes to dry, prepare all veggies: thinly slice onion, slice leeks into 1-inch long pieces. Place a wok (or wok-shaped pan, heavy-bottomed pot) over medium high heat. Add at least 1 inch of oil. When oil reaches 350F, add potatoes. Cook in 2-3 batches depending on the size of your pan/pot and the amount of oil. Adjust heat to maintain the temperature of oil at 300F. Cook and stir frequently for about 5-6 minutes until fries are pale yellow and slightly bubbled. Transfer to a colander (or plate, tray) lined with paper towel to drain. After all potato sticks have been fried the first time, start frying them the second time. Add more oil if needed, when the oil reaches 375F, add potatoes. 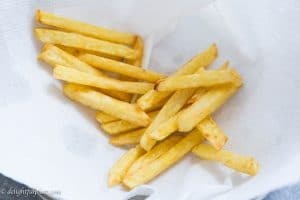 Adjust heat to maintain the oil temperature at 350F, cook and stir frequently for 3-4 minutes until fries are golden brown and crispy to your liking. 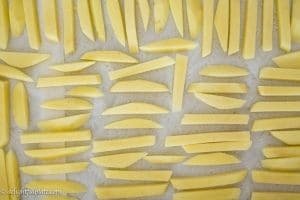 Transfer to a colander (or plate) lined with paper towel to drain, sprinkle a pinch of salt over fries. Place fries on a serving plate. Remove oil from the wok/pan, wipe with paper towel and add new oil. With medium high heat, when oil is hot, add onion. Stir and cook for 2 minutes, then set aside. Add oil if needed, wait for the wok/pan to be hot again then add beef. Spread beef slices into one thin layer, let them sit undisturbed for 20-30 seconds, then start stir-frying. When beef is 90% cooked, add onion back to the pan, quickly mix and stir. Add fish sauce, black pepper, celery leaves and leeks, stir frying until beef is fully cooked. Turn off the heat, adjust seasoning to taste. Top the fries with stir-fried beef (or place beef next to fries), sprinkle cilantro over everything and serve hot. Just came across this on Pinterest Sophie! Looks like an absolutely cracking dish. My mum made something very similar to this growing up… and when I saw the chips in the photo it just reminded me of it! Great post!